Recently, a small group of vocal enthusiasts has claimed that all of biblical prophecy including the final resurrection and last judgment was completely fulfilled in the first century. The supporters of this idea have caused some to abandon the historic, biblical, and creedal positions on the return of Christ. 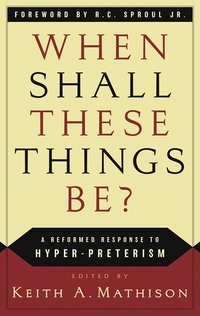 In this volume, edited by Dr. Keith A. Mathison, several Reformed scholars contribute essays refuting the position of full preterism. Contributors include Charles Hill, Simon Kistemaker, Keith Mathison, Robert Strimple, and others.